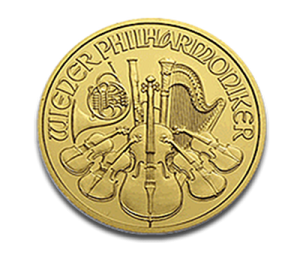 The gold Austrian Philharmonic, also known as the Vienna Philharmonic, is the best-selling gold bullion coin in Europe. First produced in 1989, this coin led sales worldwide in 1992, 1995, and 1996. The Vienna Philharmonic is an excellent choice for investors who prefer pure, 24 karat gold coins, as opposed to the American Gold Eagle or South African Krugerrand, both of which are 22 karat (91.67%) purity. The gold used to mint the Austrian Philharmonic coin has not been mixed with base metals. This .9999 fine gold coin contains 1.0 troy ounce of gold and weighs 31.103 grams. Created as a tribute to the Vienna Philharmonic Orchestra, this 24-karat gold coin depicts the great organ in the concert hall of Vienna. Beneath the organ are the year, fineness, weight, and face value of the coin. The obverse features a selection of musical instruments. Many collectors favor the classic beauty of the Austrian Philharmonic over the designs featured on other gold bullion coins. The largest diameter one-ounce pure gold coin in the world, it measures 37mm in diameter and is 2mm thick, compared with the 32.7mm diameter of the Gold Eagle and South African Krugerrand. 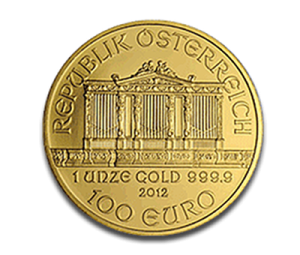 In addition to the popular one ounce size, the Austrian gold Philharmonic is also minted in ½, ¼, and 1/10 ounce sizes, each of which features the same images found on the one-ounce coin. All sizes are minted at the Austrian Mint, a subsidiary of the Austrian National Bank, which guarantees the coin’s weight and purity. The Austrian Mint has been producing coins for more than 800 years, making it one of the oldest mints in the world. Gold Philharmonics are packaged ten coins to a rigid plastic tube. The one-ounce version of this coin has a symbolic face value of 2000 Austrian Shillings (1989-2001) or 100 euro (beginning in 2002). The face values for the fractional sizes of this coin are 50, 25, and 10 euros. In 2004, the Austrian Mint produced a very limited number of 1,000 ounce Gold Philharmonics, each with a face value of 100,000 Euros and weighing in at more than 68 pounds. The Vienna Philharmonic was the first gold bullion coin to carry a face value in euros. Within Austria, the coin is considered legal tender at its face value. However, like most gold bullion coins, the Philharmonic is worth substantially more than its symbolic face value. 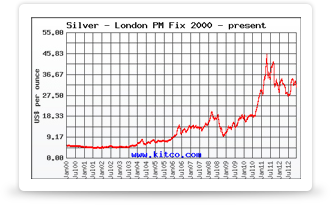 The value of the gold Philharmonic is based on the current spot price of gold, plus a small per-coin premium. Coveted not only in Austria but also throughout the world, the gold Vienna Philharmonic is considered to be highly liquid. Its incomparable purity makes it easy to convert the Austrian Philharmonic to cash. Renowned for its beauty, quality, and purity, the gold Vienna Philharmonic coin provides investors with a way to diversity their portfolio through physical gold. Since 2008, the Austrian Mint has also produced a Silver Philharmonic coin, identical to the gold coin except for the inscription stating the face value and metal content.